A 15-year-old boy has been arrested for allegedly slashing another student in the head inside a Queens high school, sending it into lockdown. Wale Aliyu reports. A 15-year-old boy has been arrested for allegedly slashing another student in the head inside a Queens high school, sending it into lockdown, police said. 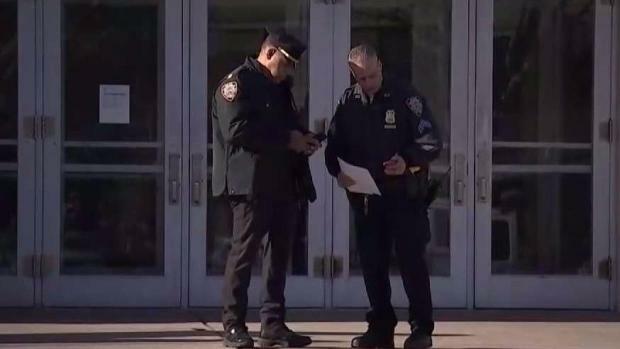 The teen allegedly slashed a 16-year-old boy across the forehead at Benjamin Cardozo High School in Bayside shortly before 9 a.m. on Tuesday, the NYPD said. The 16-year-old was taken to the hospital and received treatment for non-life threatening injuries, according to police. A student slashed another student in the head inside a Queens high school, sending the school into lockdown. Wale Aliyu reports. The union that represents the city's school safety agents said the victim was on a staircase inside the shool when the other student slashed him. The victim, who is the son of a school safety agent, had to get more than 500 stitches across the top side and bottom of his face after the attack, according to the union. The 15-year-old who was arrested has been charged with assault and criminal possession of a weapon, police said. A city Department of Education spokesperson on Tuesday said police and EMS "immediately responded to a serious incident at Cardozo High School this morning where a student was transported to the hospital in stable condition." "We are working with NYPD as they conduct an investigation, and are taking additional safety measures at the school," the spokesperson said. Students told News 4 the two boys had been fighting for several weeks prior to the attack. The attack was recorded by students at the school and posted to Snapchat.